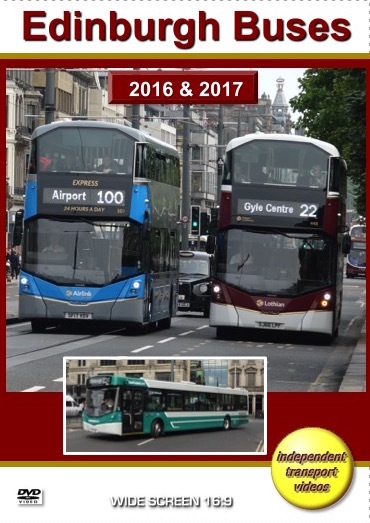 Since our last DVD programme featuring Edinburgh buses in 2013, a great deal has changed in Scotland’s capital city for the follower of road public transport. The independent transport videos cameras have made two visits to record the changes in the bus scene, one in 2016, the other in 2017. We begin the first of our two visits of this fast moving action packed programme in August 2016 on the famous Princes Street. Here we film the smart Lothian Buses in action together with buses from FirstBus and Stagecoach. We also film the open top ‘ERM’ AEC Routemasters in their last year of operation in Mac Tours livery, which was part of Lothian Buses. The ‘new’ Lothian Buses livery is much in evidence featuring the ‘swoop’ style on the elegant dark red (formally madder) and white scheme with a gold trim. Also new are high specification Wrightbus bodied Volvo B5TLs in the 2015 version of the Airlink livery of mid blue and gold. We also film some action on North Bridge, but most filming takes place along Princes Street and includes footage of the trams as they work alongside the buses. We now move to 2017 and our filming captures the many changes that have taken place in just twelve months! Our filming begins in Shandwick Place where we see the new livery applied to the latest Volvo B5TLs on the Airlink service, as well as the new First Midland Bluebird livery of two tone blue on a new ADL Enviro400 MMC double-decker. Other locations include Princes Street, Lothian Road, The Mound and Waterloo Place. Since 2016 the livery and fleet names have been revised on the Lothian Buses and this is in evidence on the buses as they pass by our cameras. We also see the smart green and cream buses of Lothian Country (a Lothian Buses subsidiary) and the green and pale grey livery on their East Coast Buses subsidiary - these are also applied in different styles! Look out for the brand new Volvo B8RLE Wright Eclipse Urban 3 single-deckers in the East Coast Buses livery. These 40-seat buses are the first of their type to operate in the UK and look quite stunning! Now the ‘ERM’ open-toppers have been retired, the sightseeing tours in Edinburgh are in the hands of a brand new fleet of 30 double-deck open-top Wright Eclipse Urban 3 Volvo B5TL buses in three different liveries, all being operated by Lothian Buses. We see them in action at various locations, but especially on The Mound as they make their way up to the old part of this lovely historic city. The trams are also captured as they work along Princes Street. We hope you enjoy this programme, which reflects the great changes that have occurred to the buses of the Scottish capital.